For a few days now, I got my first Sony Playstation console ever. 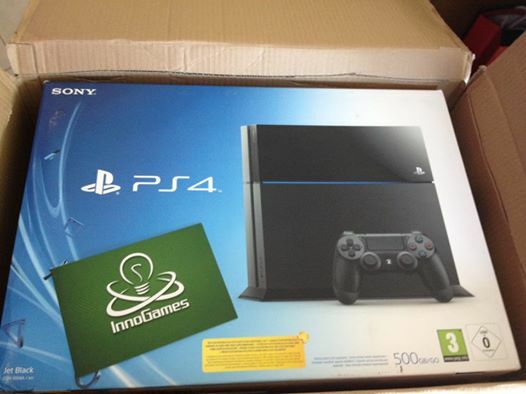 It’s the new PS4 and I didn’t actually buy it but I won it as a prize in a World Cup related contest! ut then again my use of these devices doesn’t actually qualify them as gaming devices. After all, maybe I am not considered a gamer anymore. Of course my relationship with games has always been close due to various web properties that I own, but since my college years the only game I have played is probably Football Manager! Anyway, as I started this note, I won a PS4 in Innogames’ World Cup prediction league of the recent Brazil 2004 WC. My relationship with Innogames is that I promote their browser games, on my we properties as a publisher and this fact gave me the option to participate in that contest since it was closed only for their partners. The competition was more or less predicting the final scores of every WC game and earning points according to how close you guessed the actual final result. Well, I did pretty well and that earned me the new PS4! Thanks a lot Innogames! First impressions are great, this console produces incredibly great graphics! It’s 500Gb HD is currently occupied mostly by sport games simulations (like Fifa14, NHL14, NFL14 etc) in their demo versions but I am certainly looking forward to try other genres as well. I have been looking for this for a while with no luck. Finally I found some code that with small alterations worked. There can be other more effective solutions for this out there, but I am not aware of them. Χαμός γίνεται τις τελευταίες μέρες στο Internet, από την ώρα που ξεκίνησε ο διαγωνισμός Amstel! Ο διαγωνισμός προσφέρει 2100€ κάθε μέρα σε έναν τυχερό που θα συμπληρώσει τον κωδικό που θα βρει στο καπάκι της μπύρας. Ο διαγωνισμός τρέχει και σε affiliate πρόγραμμα με αρκετά ελκυστικούς όρους με συνέπεια να είναι ένα από τα αγαπημένα προγράμματα των Ελλήνων affiliates αυτές τις μέρες! Posted on August 12, 2011 August 12, 2011 Categories computer engineeringTags google pagerank, seo1 Comment on What is Google PageRank Good For? Ήρθε η ώρα για την αναβάθμιση του εξαιρετικά επιτυχημένου ΔΩΡΕΑΝ παιχνιδιού στρατηγικής Grepolis, στην έκδοση 2! Ο πρώτος ελληνικός server θα ξεκίνησε στις 6 Απριλίου! Μην χάσετε την ευκαιρία και δείτε πρώτοι την νέα έκδοση!